There are many articles, podcasts and discussions about the use of red light therapy. You might even have heard it being referred to as photobiology. The scientific based benefits are far reaching. In Appendix 1 at the end of the article, you’ll find a list of some of the potential benefits. The question is how can a red (or near-infrared) LED bulb bring such benefits to the human body! We are going to write a series of short articles that discuss the basics for each benefit, practical implications, and maybe some other benefits that you had not considered. But first…a touch of theory. It is not just light that we can see that comes from the sun. 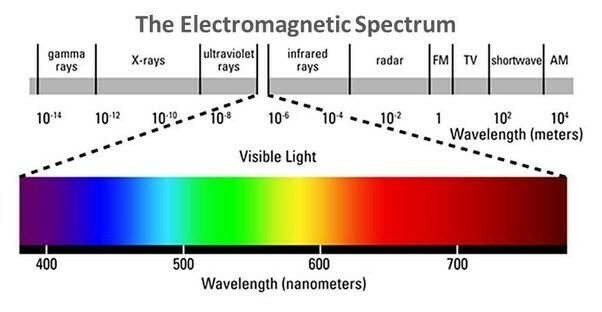 White light can be split up into a spectrum of many different wavelengths and colours, and visible light is just part of a continuous spectrum of electromagnetic radiation. Our focus is on the visible light and near-infrared light spectrums, which have the identified benefits that we exploit through Red Light Therapy (RLT). The red and near-infrared light spectrums have scientific evidence that they have a biological impact on our bodies. The red spectrums of light penetrate the skin deeper that other light spectrums, reaching the hypodermis (for example wavelength of 694nm can penetrate 15mm into the body). It is this deeper penetration that allows the benefits to be so far reaching as the deeper cells are impacted, photons can enter the blood stream and be passed throughout your body as well. You probably know that the food you eat is converted into ATP for energy production. ATP production can also be stimulated by red and near-infrared exposure in your mitochondria. Trying to keep it simple…through a number of metabolic events in your mitochondria, ATP production is stimulated. This is the energy source behind everything that happens in your cells and body, including cell repair and regeneration. Therefore, more ATP is a very good thing, which leads to a lot of the benefits identified with red light therapy. More ATP, better performing mitochondria, better body and health! LEDs have the ability to be programmed to emit light in very specific wavelengths, which are proven to have therapeutic benefits. The beauty of using LEDs is that they do not emit much, if any heat. Incandescent and halogen bulbs, including heat lamps on the other hand exhibit too much heat to be considered for light therapy of this nature, and long exposure times. …we will dig a little deeper into which wave lengths have healing powers, and what you should choose!